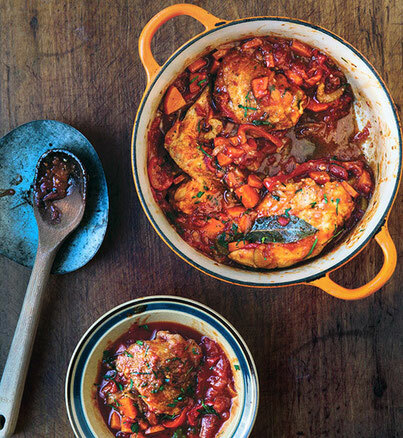 The recipe for this stew, a northern Italian braise of chicken and vegetables in a tomato sauce, is adapted from Marcella Hazan's book, Essentials of Italian Cooking (Knopf, 1992). Heat oil in an 8-qt. saucepan over medium-high heat. Season chicken with salt and pepper and dredge in flour. Working in batches, cook chicken until browned, 10–12 minutes. Transfer chicken to a plate; set aside. Add rosemary, garlic, bay leaf, carrot, bell pepper, onion, and celery to pan; cook until golden, 6–8 minutes. Add wine; cook, stirring and scraping browned bits from bottom of pan, until reduced by half, about 3 minutes. Return chicken to pan and add tomatoes; bring to a simmer. Cook, covered, until chicken is tender, about 30 minutes. Uncover and stir in parsley. Using tongs, transfer chicken to a serving platter; spoon sauce over the top.